Rising star, FS (Fuying & Sam) are going to take another big leap ahead in the Chinese music industry! 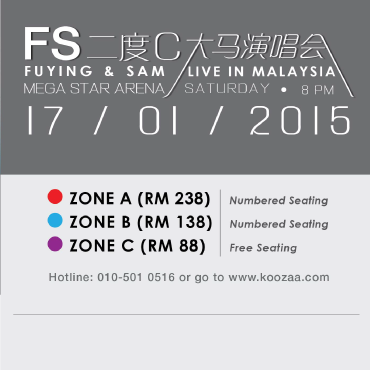 FS will be having their very first concert in Malaysia! Venue: Kuala Lumpur’s MEGA STAR ARENA, Kuchai Lama. 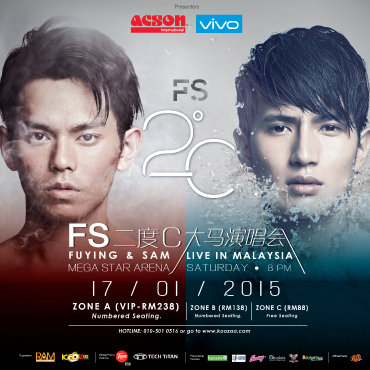 FS (Fuying & Sam)’s “FS 2°C CONCERT LIVE IN MALAYSIA” is proudly presented by ACSON & Vivo Smart Phone, with TUNE TALK and TECH TITAN as the Official Promotions Partner, and the support of Official Radio MYFM and other promotion partners - Bossini, CD Rama, Neway, Absolute Technical Production. 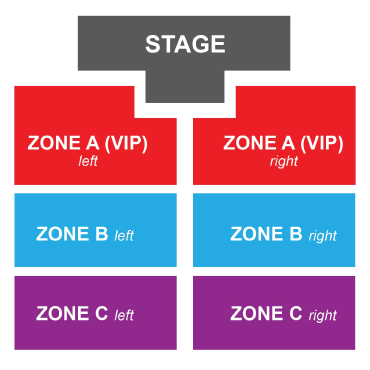 Concert ticket can be purchased from all CD Rama outlet and Koozaa.com. Kindly visit koozaa.com for more detail.